With two months left to go until the release date of Episode 1, the much beloved Life is Strange series recently dropped a second teaser trailer for its sequel, one that has some shocking implications. For those familiar with the recent free spinoff released by publisher Square Enix, The Awesome Adventures of Captain Spirit, the explosive final moments of the teaser trailer weigh heavily on the mind. Developer Dontnod Entertainment has stated before that Captain Spirit serves as a precursor to the Life is Strange sequel, and will carry over previously made actions and choices. While little information was given in the newest trailer, the choice to highlight a specific moment that immediately established the dark tone of the game seems suspiciously like an intentional foreshadowing for fans that have paid attention thus far. A recurring theme in any franchise that revolves around supernatural powers has always been about the fractured psyche; these powers always manifest in climactic moments of escalated tension, stress, or life-threatening urgency. More often than not, backstories of tragedy and despair lay the blood-soaked foundation for the emergence of cathartic power. The Life is Strange series is no exception. The story of Max Caulfield, a shy girl from the Pacific Northwest, is not one of love and reunion, but of an intrinsic desire for change fueled by chronic regret. Racked with a lifetime of guilt for having abandoned her ex-best friend, Chloe, during her time of need, Max’s accumulation of remorse projected with full force during their fateful reunion, where Chloe is shot to death in a bathroom. Appropriately, it is at that moment Max discovers her ability to rewind time and remake past choices. With that being said, this theme of trauma-induced supernatural emergence is also evident in Captain Spirit, and prophesies ominous events to come. 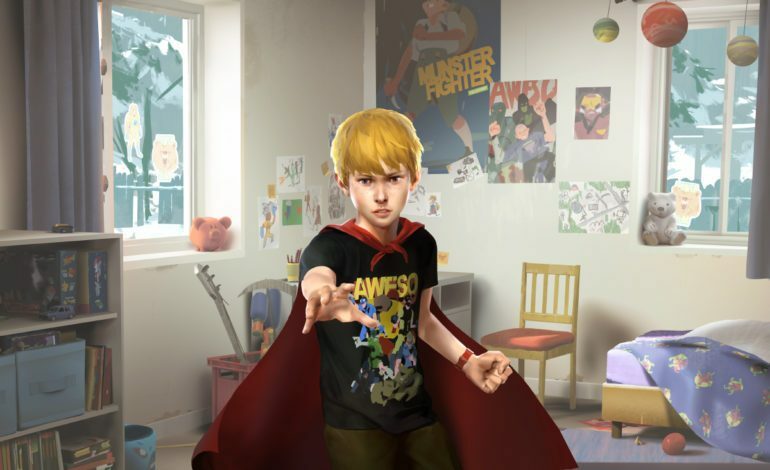 In the game, an innocent, 9-year-old Chris personalizes his own alter ego: a superhero by the name of Captain Spirit. Mentally caged by the death of his mother, and emotionally abused by his alcoholic and unstable father, Chris invents a world to escape into, one where his limited powerlessness in real life no longer matters. The cheery, brightly colored world of Captain Spirit may seem simple and picturesque on the surface, but much like the broken depths of the mentally ill, the subtle clues and dialogue strewn throughout the game illustrates a forlorn and desolate childhood. Chris’s constant escapades point to an intricate representation of child abuse rarely portrayed in video games. Through the lens of his imagination, the allusions to his internal struggles with loneliness and the loss of his mother are both heartbreaking and wistfully melancholic. While signs of physical abuse are merely hinted at through bruises on Chris’s arms, an instance where his father violently breaks a door, and an angry shove at the end of the game, the insinuation of ongoing mistreatment is just as appalling. Near the end of the short game, the parallels to Life is Strange become clear. Just as Max draws out her powers in her time of need, Chris discovers his own telekinetic abilities when his father shatters his fragile worldview and a dangerous situation forces the expression of his innate gift. The game ends on a bittersweet note, where Chris is shown interacting with neighboring kids, blurring the line between reality and the fantasy he’s built up as a survival tool. If we extend the parallelism, however, the potential tie-ins with the Life is Strange 2 teaser trailer become all the more likely. In the climactic conclusion to the original game, Max makes a great sacrifice that holds morbid implications and loss of life. To that end, it’s entirely possible – even probable – that the series will take this direction further with Captain Spirit and the sequel. The telekinetic explosion seen in the recent trailer may have some sort of involvement with Chris and his newfound powers, a dire consequence of inheriting an ability born from emotional instability. With the link between these two games, this may set up Life is Strange 2 as a much darker and more violent dive into the fallout of child abuse. Should the series take a tonally distinct turn, the metaphorical duality of Captain Spirit may inject a whole new level of story-telling mechanics into the game. One way this path can go is that just as an innocent Chris creates these elaborate scenarios and settings of Captain Spirit doing missions in his mind in an attempt to block off reality, a damaged Chris with violent tendencies might utilize similar internal world-building to justify his actions in the real world. There is little information to base this on, and many directions the studio can go, but with child cruelty and a stunted psyche as a central conflict in the spinoff, we will likely see Chris’s life take a turn for the worse. Of course, this is all just speculation, and the official trailer on August 20 will undoubtedly answer all of these impending questions. But for now, the narrative behind Life is Strange’s psychological themes on loss of innocence and the consequence of choice, combined with the daring decision to make a story of child abuse the plot of a free spinoff game, makes for an engaging topic deserving of theory-crafting and thought.